I was born and raised in New Jersey. 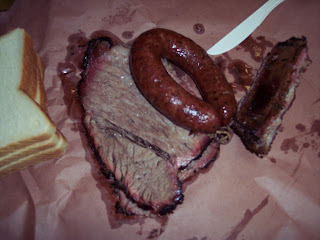 I didn’t taste Texas barbecue until I was twenty-two years old. What the hell do I know about barbecue? And what could I add to the millions of words that have been written on the subject? Well, I know a bit about food. I’ve managed to check out a few of the finer joints in Texas – Sonny Bryan’s Smokehouse in Dallas, Joe Cotton’s in Robstown before the fire, the dear departed Williams Smokehouse in Houston, and the incomparable New Zion Missionary Baptist Church in Huntsville. So I can speak from a reasonably wide experience. This will not be a comprehensive discussion of the relative merits of Texas barbecue as opposed to the fare available in places like Memphis or the Carolinas. 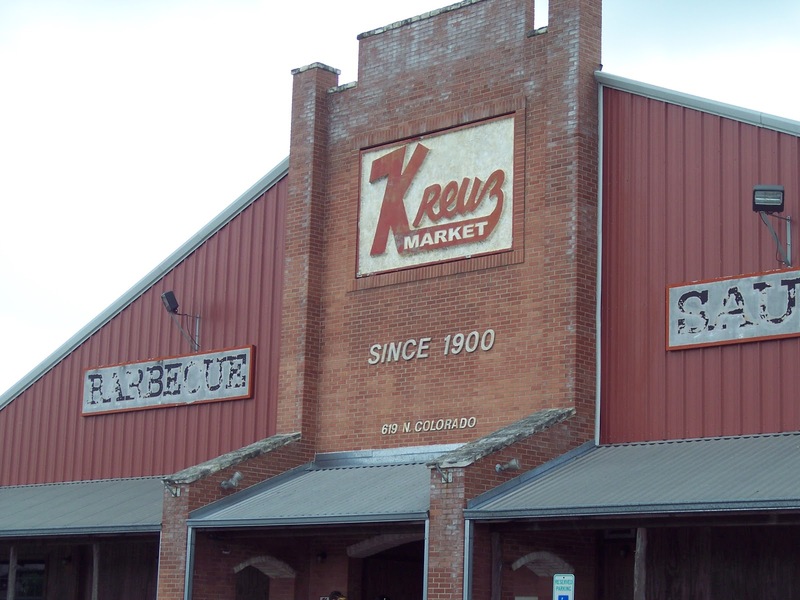 It’s simply a take on our recent visits to Lockhart and the relative merits of Smitty’s versus Kreuz from our point of view. I’ll get all over academic in a later post. On our way out to the ranch in Crystal City, we stopped at Smitty’s. You have to look for it. The paint on the small wooden sign is peeling and the screen door looks like it was lifted from somebody’s hunt camp. But when you walk in the door and down that funky hallway to the pit in the back to make your order, that wonderful wood-smoke, Texas-beef smell fills your nostrils. There’s a single chopping block and a young man ready to chop/slice up your order. We went for a link of sausage, a half-pound of brisket (fat), and three ribs. They offer lean brisket, but well- marbled, greasy brisket is why God invented simvastatin. Our order was weighed and placed on a few sheets of butcher paper along with a few slices of thick white bread and a plastic knife. Yep, a knife. No fork. You’ll eat with your fingers, lick ‘em off, and like it. We walked out of the pit and into the cafeteria, a simple, rectangular room with standard 1950s folding tables and chairs. Communal seating. We ordered pickles, onions, potato salad, and a couple of beers. All in all, $20.00. Before I review the food at Smitty’s, let’s head over to Kreuz Market, our stop on our way back from the ranch. Smitty’s is tucked away mid-block, in town and off the highway. Kreutz is visible from the highway, as stand-alone as a suburban drug store, surrounded by a huge parking lot. Smitty’s interior looks as if the décor – if you can call it that – was put together with yard sale purchases and simply dusted off every now and then. Kreutz could have been built yesterday, with kitschy signs (We Shoot Every Third Salesman and the Second One Just Left. ), electronic games in the entryway, all varnished wood with booths and tables. It could have been built on a freeway exit last week. That same Texas barbecue smell permeates the place, though, and you take that same walk to the pit in the back, but there are multiple stations instead of just the one. Same order – sausage, brisket, and ribs. Same butcher paper. Same plastic knife. Same sides. Same price. Now for the payoff. Smitty’s versus Kreutz. The sausage was a wash, smoky and spicy and dreamy in both places. If you’ve never had authentic Texas pit-smoked sausage, you’ve missed out on a treat. You can treat yourself in either place. Kreutz won the rib war. The ribs were the right size, moist and just this side of falling off the bone, smoky meat that melted in the mouth. Although it may be that the ribs at Smitty’s were a bit small and a bit dry because we arrived closer to 1:00 PM than noon and therefore received the end of a slab at the end of lunch service, it’s still the case that they were a bit small and a bit dry. And I simply have never had a better set of ribs than I had at Kreutz that day. On the other hand, Smitty’s served up the better brisket, sliced just the right thickness with just the right marbling and moisture. For some reason, the slices of brisket at Kreutz were thicker at the bottom than the top and the top, above the line of fat, was a bit dry. Good, better than good, but not perfect. As far as the sides go, Cathey preferred the more traditional potato salad served at Smitty’s. I didn’t care. The roll of paper towels at the tables were a nice touch over the napkins at Smitty’s. Bread, pickles, and onions were on a par. All in all, an exercise in the picking of nits. Great barbecue. Can’t go wrong.